All of us have read the books by Anastasia Novykh, have watched the programmes with the participation of Igor Mikhailovich Danilov, and it would seem as we have got the answers to all the questions. Now, when anyone in theory can tell how to become an Angel, it is only a matter of passing from words to deeds. In the programmes Igor Mikhailovich says that it is necessary to study the system to understand how it works in ourselves, what we think and why, whether we think in general and who thinks in us and encourages to answer the question “who am I?” and also says a lot about the consciousness. So, in the study of the system, or rather my consciousness, I have paid attention to the fact that it works constantly! It works in the morning, afternoon and evening; at home, at work and away; when I’m in the shower, when I am eating, tying up my shoelaces and even when I am sleeping, yes, it is so that, a dream is a derivative of the consciousness. But the most unpleasant is that it starts work strenuously, when I do meditation and spiritual practices! The consciousness constantly bombards with the thoughts that I accept or can accept, offers the images of various situations, suppositions, expectations, appraisals, different “I want something” and turns it over again and again, just maybe on the other hand or in a different wrapper, but all the same. In my turn, I give them the power of my attention watching with great interest all the plays offered me by the consciousness. Further everything goes as usual, in accordance with the set scenario: recirculation of the thoughts on one subject or a lot of spectacular sketches on any other subject interesting for me as the Personality. To be honest, the shifting off responsibility for my choice to the Animal nature or to the system is also a trick, because if I gave way to it, it means it was interesting for me! I think it is better not to shift off my weakness to someone or something, but humanly, be honest with oneself, assess the situation impartially, make a conclusion and with new forces move towards the goal. In my opinion, it is more correct than to shift off all the blame on the Animal nature, saying: “There is nothing to take from the Beast.” Again, it was mentioned more than once in the programs, was written in the books that a person should be honest, first of all, in front of oneself, in front of God. In the programme ”LIFE” Igor Mikhailovich also says that the consciousness should be kept constantly busy otherwise it will keep you busy. This happens to everyone. 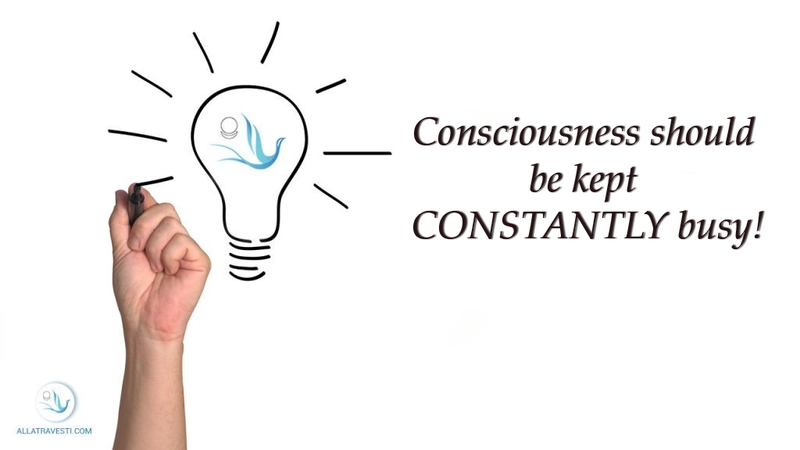 The consciousness should be kept busy… Constantly! In my opinion, having read the books, having seen the programmes more than dozens of time I have finally realized… I have started doing something, that is, keeping the consciousness constantly busy how I knew, how I could, in the way it has been doing. Consciousness must be kept constantly busy. This is the first and the most important thing. If you do not keep it busy it will do it with you. I have started reading all the books that have been of some use somehow, I have started doing it always and everywhere at every opportunity: in the tube, trolleybuses, buses, even in the route buses, I have done it standing, waiting for the transport, on the way, crossing between the stations. If I have not managed to read, I have listened to the audiobooks, have seen informative films and programmes everywhere possible: at home, at my place of work, in the public places and so on. I have remembered that someone told that physical work also helps. I have started working more physically but I have soon noticed that it has been ineffective to me as when the body has been busy the thoughts have still passed through my mind and I have had to combine physical work with the the same audio-books. I have started to practice anything everywhere possible:”Lotus”, I have just kept aloof from the thoughts (some kind of thoughtlessness), depending on the fact how the consciousness has reacted, I have added the prayer. In a spare time at work I have practiced the relaxation techniques, autogenic training, “jug”, concentration on the tip of the nose and other meditations and spiritual practices described in the books by Anastasia Novykh. Before going to bed I have practiced the “Lotus Flower”, have tried to do it always with the thoughts about the Soul, but even better has fallen asleep in a feeling dialogue with God. Hopefully, there are enough tools on all the occasions, we should only use them. The hardest thing for my Animal nature was to do something good for the society. As far as I have understood for today, the Spiritual Path includes two main aspects. The first one is the work on oneself and the second one is good deeds. In other words, happy thoughts and good deeds are exactly the way leading to God, like two handrails of the bridge leading to Eternity. After all, good deeds are so natural, for the one who has chosen the way to God, they even bring pleasure. What else should be done in this world except good deeds? Taking into account that when I do good deeds I progress more quickly in following the spiritual path, as it is the same work on oneself. After all, as I have already said , the Animal nature does not like to do something for others, but if it does not like it, then, for sure, I extremely need it as the Personality. In addition, concerning the good deeds I have realized that a really good deed is a distribution of the Primordial Knowledge. As it is the most invaluable treasure for every person! It is exactly something that is able to make everyone happy! If the Primordial Knowledge can help a man, every man to become free and happy, it means that for a single person and for all the people I cannot do anything better than to tell them, as far as I can, about the Primordial Knowledge. That is why it dissuaded me from this in any possible way and invented lots of pretextes (by the way, it drones on the same right now). I have tried and I try not to evaluate anything and anyone, not to judge, not to turn over illusions in my head, not to make up something that does not exist, but to accept everything as it is – easy and joyfully. You would not believe but just after three months of such work on oneself, under various situations, failures and pulling oneself together again, only after three months of hard everyday work on oneself, overstepping my Animal nature, breaking it down, I have hardly started to notice that it has become a bit easier to separate from the consciousness in meditations and to plunge in the deepest feelings. You see, I have become neither an Angel, nor a Bodhisattva, it has just become a bit easier not to yield to the tricks of my consciousness. However, due to this experience and opportunity, to tell more precisely, due to the forming of the conditions for this deepest plunge, I have got in touch with something really deepest, with something boundless, something Alive. I have just got in touch! I have not cognized it as the consciousness is trying to convince me, I have not reached it but I have just slightly got in touch with it. Before this, during two years after reading the books by Anastasia Novykh, doing meditations and spiritual practices, described in these books, visiting the classes, using fine and clever words and I have been thinking that I have been following the Spiritual Path. Now I have clearly realised that I have not even started following this Path, I have finally begun at least understand something, by means of something, at least in some way how this world is organized. It seems as nothing has changed and I have been keeping my consciousness busy as usual, and I am as I have been before, I do all the same, but somewhere deep inside I feel something really quivering, tender and alive, something that is impossible to describe by anything and there is no need in it. Now the moments without thoughts happen, even though short in time, even though several times, but they appear. It happens that I have not dreamt anything during the night and in the morning I am bright and cheerful and it is easier to feel the connection with the Soul, even though it happens quite seldom, but it happens. It is getting much easier to do the spiritual practice “Lotus Flower” during the day and it is easier to pacify one’s pride, to weaken the position of the Animal nature, but to keep this deepest connection, again not always, but still to keep. They tell the truth: idle mind is devil’s workshop and the consciousness is as a wild animal. We should not loosen our hold on reins. As soon as I am tired or relaxed the consciousness immediately assaults, instantly, ruthlessly. It is merciless, it does not miss a single chance to keep me busy. The consciousness never rests! It is as clear as noonday. The Personality never rests! Thanks God, it was written and told about more than once. However, “the human mind is a battlefield of these two natures” (“Sensei of Shambala. Book I.” A. Novykh), it depends only on me what to choose: either to listen to the consciousness which keeps me constantly busy or to keep it busy with something useful and live peacefully. The words by Igor Mikhailovich that the person should simply live, but in order to live the one should struggle first, are like a balm for the Soul, what else can be said. My consciousness, of course, told me that I was one of those who simply “stood up and went”, but it was a deceit. In reality, I should struggle like billions of people living on the planet in order to understand something. All these constructive proofs, lucky or unlucky chances, fine fairytales about the Chosen by God – are the banal lies of my consciousness! That is why, as it is said, I should roll up my sleeves and work on myself. It has been already discussed in the programmes more than once, has been written in the books but why have I continued to philosophize, to pretend but not to be? By the reason that the consciousness is not me. Oh, how easy it became when I confessed myself that I was just an ordinary man and it became much easier to get rid of the illusions concerning my “holiness” or “that I am someone special” and it turns out much sincerely to do good deeds and it is more fun in living in general. P.S. The consciousness should be kept busy…Constantly! Always! Otherwise it will keep you busy. It is one of two things, nothing else. The Spiritual work on oneself is a work, it is everyday work within oneself! А lock of cut hair retains its connection with a person.